What are China’s new circuit courts doing? In January, 2015, the Supreme People’s Court (the Court) established circuit courts (actually circuit tribunals) in Shenzhen and Shenyang. Are they doing anything more than serving as places to divert petitioners from Beijing? 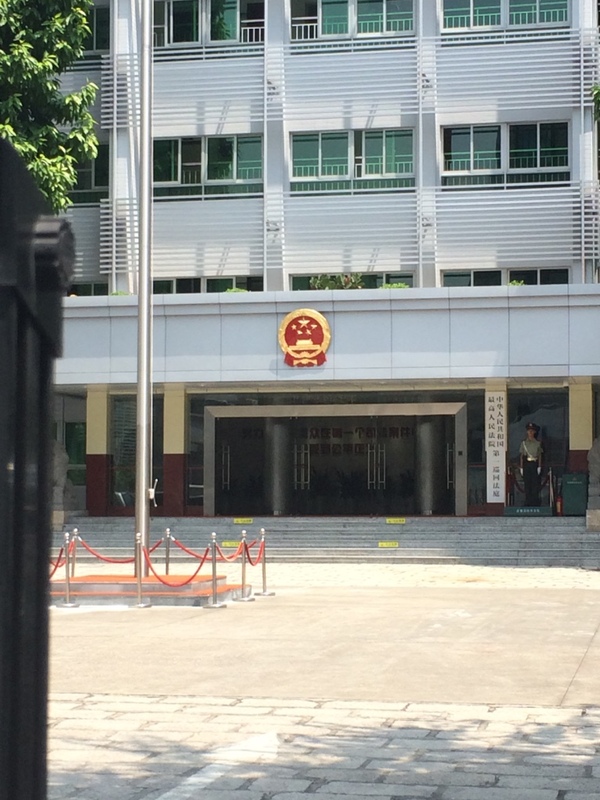 In September I visited the #1 Circuit Court in Shenzhen to have a look for myself. The #1 Circuit Court It is located in the former Shenzhen Intermediate Court building, but an annex contains the reception area for petitioners and separate area with courtrooms. Visitors, including petitioners, enter through the entrance in the photo below. 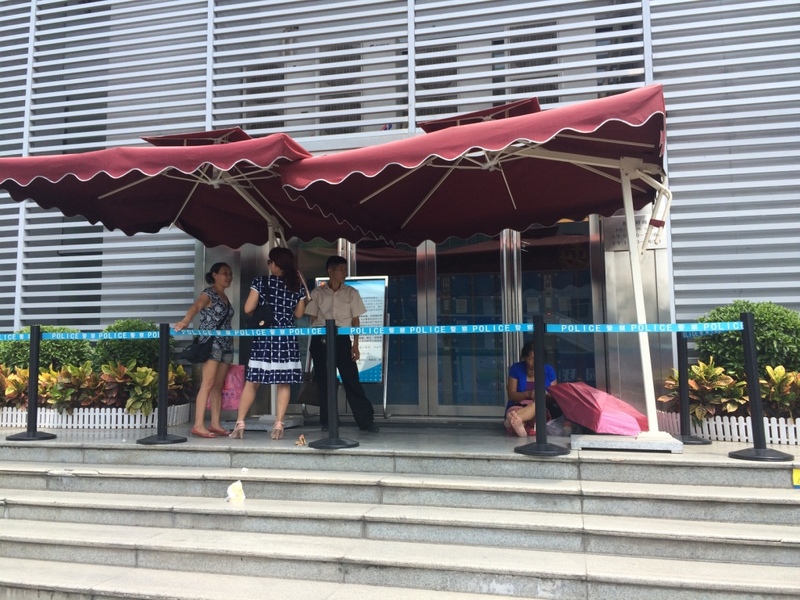 The burdensome security checks that Chinese lawyers have complained about for many years still operate, with security personnel (and the system under which they operate) who seem to be unable to distinguish between professional visitors and persons who may be a security threat. The circuit courts are not separate level of courts, but a branch of the Court, but have a narrower jurisdiction, as set out in the regulations governing their operation, primarily civil, commercial, and administrative. Part of the goal of the circuit court is to implement the personnel and structural reforms that the Court is promoting. There are 12 judges, plus 12 judge’s assistants, who come from areas outside the circuit. The twelve judges are profiled on the Court’s website. The judges do not serve in fixed collegiate panels, but each serves as presiding judge, with cases assigned randomly, and hearings in appeal cases focused on the issues in dispute on appeal, rather than a re-opening of the entire dispute. The #1 Circuit Court occasionally “rides circuit”– hears cases outside of its headquarters. As of early September, the #1 Circuit Court had accepted close to 500 cases. The hearing that I attended was an appeal from the Hainan Higher People’s Court, a dispute over shareholding between a Hebei and Beijing companies. The presiding judge was Gao Xiaoli, formerly of the #4 civil division, who often writes and speaks on arbitration, private international law, and judicial review of arbitration. She, like her other colleagues is highly experienced. In the Court, the interns first review the petitioners’ materials. If these materials fulfill the procedural requirements, the petitioners then would talk to the judge’s clerks and the clerks would decide whether to recommend the case for a further review by the judges. The judges would make the final decision of whether to grant a retrial. The clerks in the Court were actually sitting judges from the High People’s Court and Intermediate People’s Court from provinces other than Guangdong, Guangxi and Hainan. My job there included: 1. to review the cases filed by petitioners and decide whether their cases have fulfilled the procedural requirements stipulated in the procedure laws, and whether the cases belong to the 11 categories of case stipulated to be handled by the Court; 2. to assist the clerks to document each petitioner’s case; and 3. to review the letters written to the Court, categorize the letters by their subject matter (criminal, civil, administrative or non-litigation), geographical associations and procedural status, and decide whether the letters should be resent to the High People’s Court of Guangdong, Guangxi or Hainan, or be resent to the SPC in Beijing or stay with the Court for the judges to review…..during the work, people realized that many petitioners have difficulty in finding good legal assistance and then the Court set up place for lawyers to offer free legal advice to the petitioners in late July. Window to the world or window dressing? The #1 Circuit Court isn’t window dressing, although it seems to receive foreign delegations regularly. What it does is provide the Court with more headcount to hear more cases, pilot structures promoted in the judicial reforms in a environment under the Court’s direct control, seek to improve the quality of its legal policy role by research into local legal issues and greater interaction with the local legal communities. Shenzhen is often on the leading edge in China in legal matters, particularly in commercial law. This entry was posted in Court Reform and tagged circuit courts, Supreme People's Court.